Nigella Sativa is also known as Black Seeds or Black Cumin Seeds. The seeds and their oil are used medicinally and regularly. The oil can be drizzled on food, though should not be heated, and makes a really nice alternative to vinegar in dressings. The seeds can be used to flavor a meal and are added to stir-fries, casseroles, etc. 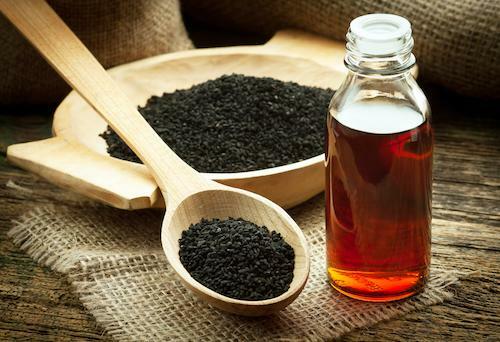 As a medicine, Nigella Sativa is typically taken in its oil form, called Black Seed Oil. To save the user from its strong, oregano-like flavor, some manufacturers are encapsulating the oil. I like the oil, even though it can be hard to swallow. Mix the oil with honey and garlic and you’ll get a great immune tonic. It is especially useful during cold and flu season. The amount of research conducted on this herb makes it one of the most evidence-based herbal medicines. Extensive studies show that Nigella Sativa is an antidiabetic (lowers blood sugar and improves insulin sensitivity), anticancer, analgesic (relieves pain), antimicrobial (fights bacteria, viruses, and parasites), anti-inflammatory, antioxidant, spasmolytic (relaxes spasms), bronchodilator, etc. Great for diarrhea, reflux and GERD, SIBO, and liver disease, asthma and allergies (it is also an antihistamine), arthritis and pain, high blood pressure, it has even been shown to be beneficial for improving memory and cognition. Making it useful for, well, pretty much everything. Rich in antioxidants, terpenes, anti-inflammatory compounds, and essential fatty acids, the components of Black Seed Oil are what make it so impressive. Perhaps the most important ingredient is the high thymoquinone content, which has all of those great health-promoting benefits from above. Black Seed Oil is a strong oil that tastes a little bit like oregano. Treat Black Seed Oil like any other oil you would purchase. Look for a product that is cold-pressed, organic, and comes in a dark bottle to block the light. Go ahead and give it a try, I know I will! And please, let us know what you think! Will it helps to people suffering with Hashimoto’s Hypothyroidism? I’m intrigued. Do you know where I might find some? We have it here at Vail Valley Pharmacy. Open 9-7 Monday – Friday, 9-5 on Saturday. Or give a call and we can mail it to you. 970-569-4150 and ask for Jeff.